A new report by Bank One shows less than half of Americans will be using their rewards credit cards to shop this Black Friday. And that applies both online and traditional brick and mortar shoppers. This, found in the latest edition of Bank’s Rewards Barometer, which tracks consumer spending and spending habits, suggests more folks are holding back, unsure of what lies ahead from an economic stance. What’s further complicating matters for those who depend on Black Friday sales are the ongoing threats that Wal Mart workers won’t be showing up the day after Thanksgiving – and it’s not because they’re anticipating overeating and being sick the next day. The union-backed group OUR Walmart says shoppers will find “thousands” fewer workers to help them if they shop Wal Mart on Black Friday. Those workers, says the group, will be participating in a planned picket on Friday. The employees are banding together in an effort to convince the country’s largest employer to end what they call “retaliation against speaking out for better pay, fair schedules and affordable health care”. Wal Mart’s not worried, though. It says the protesters make up only a “handful” of its workforce, which totals around 1.3 million. Still, Wal Mart has filed a complaint with the National Labor Relations Board and says the unions have unlawfully organized picket lines over the past several months. It also complains these lines have disrupted its ability to do business. Finally, it says these actions are in violation of union laws. There are currently about 20 charges filed against Wal-Mart stores by individual employees and the unions with allegations that run the gamut, though getting anyone to provide details on those allegations has proven difficult. What one group, OUR Walmart is saying, however, is that this latest protest has to do with retaliations by the nation’s largest retailer when employees request medical leaves, promotions or even lateral moves within the company. Last year, the group wanted Wal Mart to recognize freedom of speech for its employees, to raise its minimum wage across the board to $13 an hour and more full time positions be provided. Wal mart, for its part, opted not to disclose how many full and part time employees it has on its payroll but has said it pays on average $12.40, which is considerably higher than federal minimum wages and it also says the majority of its workers are full time already. Could these two dynamics – concerns over picketers in front of Wal Mart and Bank One’s latest result that folks won’t be shopping as much on Black Friday, especially those who use rewards credit cards, affect the economy? Not only could they, but it could mean a new frustration for those picketers, should they opt to strike. If fewer folks are shopping in person, the effect of the strike might miss its mark. Already, more consumers are shopping on line this year than ever before. This has been an ongoing trend for years – each year producing more online shoppers than the year before. Plus, if fewer folks are pulling out their credit cards, this might be a sign that consumers won’t be spending beyond their means again this year. There’s a psychological aspect to all of this too. People are battle worn with what’s now become several years of tough economic times, high unemployment and a general lack of faith in the American Dream. A few years ago, people entered the holiday season with the mindset that it would provide a break from the breaking news that ruled our days. They wanted to escape all of that and as a result, they found themselves splurging through the holidays; if not for themselves, for their children. Now, though, even that’s grown tiresome. Couple all of these realities with concerns over the looming fiscal cliff, and folks are just too tired anymore. said one couple who was shopping for their Thanksgiving turkey in Cleveland this past weekend. It’s sentiment that’s being voiced around the country. Then, of course, there are those who are moving forward with their holiday traditions, including maxing out their credit cards and fiscal cliff be damned. While most credit card users – around 58 percent – say they are planning on maintaining their spending to 2011 levels, 14 percent say they plan to actually spend more than last year. The mere 18 percent who plan to use their rewards points to help cover the cost of Christmas and Thanksgiving is actually in line with a few other trends. 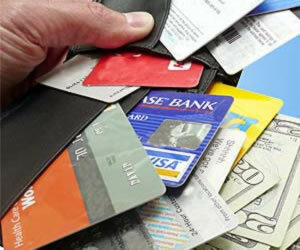 Folks are not using their credit cards. Period. Since they’re holding their plastic close, they’re simply not earning enough rewards to redeem. The Bank has another explanation, too. Affluent consumers are also shifting they’re habits, too. More are looking for sales and great deals all year long, which mans they’re buying Christmas gifts in April. Finally, another reason some Americans aren’t using their rewards points for holiday shopping could be because they’ve come to rely on those rewards and cash back credits to help offset a lack of funds through the year. They’re using those rewards on gas, groceries, lunch money and unexpected repairs or purchases. Factoring in all of these dynamics, including Wal Mart’s current brouhaha, ultimately, it’s still going to be a busy holiday for retailers; it always is. You just might not have to fight as many shoppers for that last big screen television or popcorn popper. What are your plans for Black Friday? Going out to get the deals? Will you be using your rewards card? Maybe your black Visa? Shopping online with a cup of coffee? Or are you simply going to watch those incredible classic films and sit by the fire? Let us know – we’re thinking the fire and the classic films are going to be a big winner this year, but you tell us.